Lindsey Bond is a re-settler media Artist, Educator and Mother from Edmonton, Treaty 6 Territory. Bond currently works in Winnipeg, Treaty 1, exploring how daily movement connects us to constructed and lived memory-spaces. Bond focuses her time on community-based projects that foster alliances and collaboration between Indigenous and settler communities. As Indigenous accomplice, she collaborates with artists, artist run centres and youth to create street-level photographic and video installations, postcards and books. Negotiating Spaces; an on-going act/ installation of collected stories that talk about the impact of the railway and the shifting ground around defunct rail-lines in Canada. Bond’s work has exhibited in Canada including: Gallery 44, Toronto in Proof 20, Latitude 53 Contemporary Visual Culture, Harcourt House Arts Centre and The Richmond International Film + Media Arts Festival. Bond received her BFA in Photography from Emily Carr University of Art + Design and studied Visual Communications in Edinburgh, Scotland. Most recently, Bond concluded working as the Project Manager for Resilience, a National billboard project curated by Lee-Ann Martin. Resilience is a public celebration, a creative act of reconciliation and commemoration of fifty (50) contemporary artworks by First Nations, Inuit, and Métis women artists. Produced by Mentoring Artists for Women's Art and funded through Canada Council's New Chapter grant. Visit www.resilienceproject.ca to learn more. In 2016, Lindsey was awarded the MAC Deep Bay Residency in Riding Mountain National Park during the summer of 2016 to create Negotiating Spaces: Ghost Lines. This project investigates the shifting ground between the sacred and forgotten; the effects of defunct rail-lines in Manitoba. Composed of medium-format photography, audio and text, this project strives to create an alternate archive of stories and images that are not in the history books, rather those that live in the memory of the people, communities and land effected by the railway. 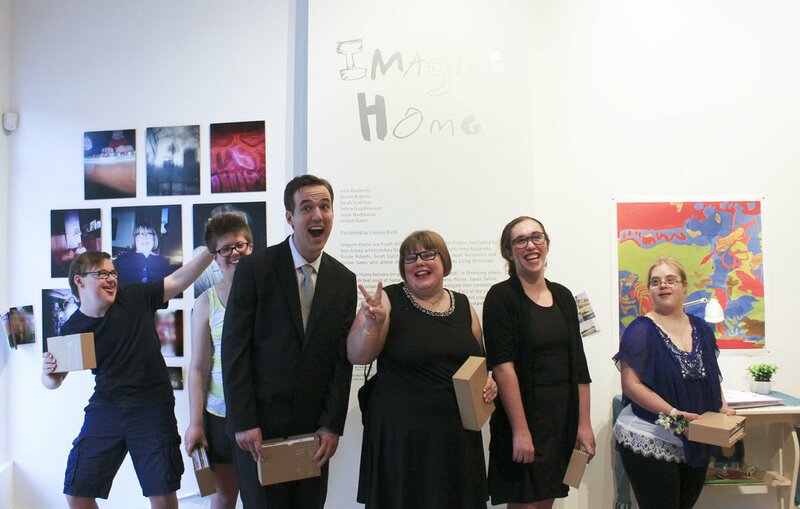 In 2015/16, Lindsey worked on Imagine Home, a Youth WITH ART Community Art Project with seven youth from Among Friends, a Community Living Winnipeg program. Supported by the Winnipeg Arts Council and City of Winnipeg, the youth investigated their relationship to place and identity through photography, drawing and writing culminating in a collection of zines and exhibition of colour Holga photography. In June of 2015, She was a guest artist on Train of Thought, a community arts journey (with a company of 30+ artists, writers, dancers and philosophers) from west-coast to east-coast of Canada focusing on collaborations and alliances between First Nations and settler/immigrant artists and communities. For more info please visit: www.trainofthought.co. In 2012, Lindsey released her first book of photography "Messages To: The Edmonton Remand Centre Newspaper". This publication extended her first public art project, exhibited in the Edmonton Light Rail Transit (LRT), funded by The Alberta Foundation for the Arts. As an Art Educator, Bond has a multi-disciplinary approach to teaching that is firmly rooted in the belief that art exists in everyday life and everyone has the potential to be creative. As an Artist in the Schools, through the Manitoba Arts Council, Bond teaches Experimental Photography, where we create a classroom sized Camera Obscura!